Borno State Governor, Kashim Shettima on today presented a cheque valued at N10 million to Samira, widow of fallen soldier and one of Nigeria's bravest war hero, Lt.Col Muhammad Abu Ali who was killed in Malam-fatori, headquarters of Abadam local government area in northern part of Borno State on Friday, November 4, 2016. The Lt.Col was commanding officer of the 272 Task Force Tank Battalion until his death alongside some of soldiers under his command following an ambush by Boko Haram fighters. 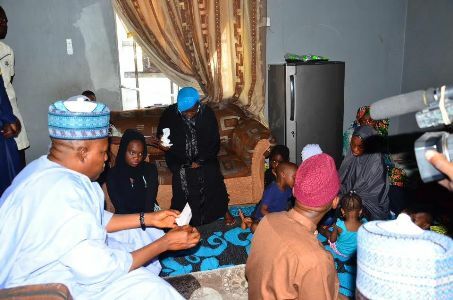 Twelve days after attending his funeral, Governor Shettima visited the family residence of the late Abu Ali at unguwar Sarki in Kaduna during which he met with the commander's widow, his three children and surviving mother, spokesman Isa Gusau said in a statement he emailed to journalists from Kaduna on Saturday. Governor Shettima presented a Zenith Bank cheque of N10m issued in the name of the widow with an instruction that N2m is meant for the widow, N2m for the mother of the fallen officer while each of the three children is to get N2m to be kept in accounts that should be opened for the children. "The late Lt. Col. Muhammad Abu Ali gave Borno everything. He worked hard in leading troops to recover many communities and at the end he paid the supreme price by giving his life for us. The least we can do to him as Government and people of Borno State is to not only pray for the repose of his soul but also to support those who depended on him for their livelihood. I am concerned about his immediate family that includes his three children, his widow and his mother. This money cannot replace his life. No amount can replace human life. We only want to support his family in the ways we can as humans. Please let us know if you need any more help. We will stand by this family and the families of our fallen heroes. I think one of the things that should console this family is the legacy the commanding officer has left behind. May Allah admit him and all those that died for Borno and this country, into paradise. Please accept our sympathy, we share your emotions and all Nigerians share this irreparable loss. It is a big loss for us in Borno because the late officer was doing us a great service that we miss" Shettima was quoted to have said while speaking with the widow of late Ali who could be heard crying during the visit. 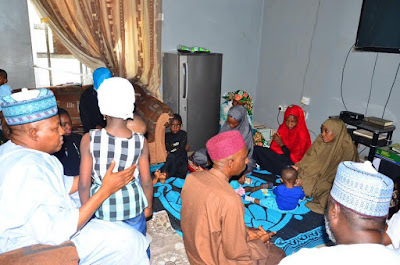 The Governor also interacted with the mother and children while special prayers were offered for the family by an Islamic scholar in the Governor’s entourage. The late Abu Ali led military battles to recapture Monguno, Baga, New Marte, Bama, Gwoza, Banki Junction, Gamboru-Ngala, Yale, Yanteke, Bita, Deruwa, Daira Kangaruwa and Mallam Fatori, all in Borno State while his men rescued hundreds of children, men and women from Boko Haram captivity. The Chief of Army Staff, Lieutenant General Tukur Buratai had described him as of his best soldiers in the fight against Boko Haram insurgency which affected Borno State the most.